Enterprise customers can take advantage of the many benefits provided by Amazon Web Services (AWS) to achieve business agility, cost savings, and high availability by running their SAP environments on the AWS Cloud. Many Enterprise customers run SAP production workloads on AWS today; including those that run on NON-SAP DBs (Oracle, MS SQL, DB2) or on SAP DBs (SAP HANA, SAP ASE). To support the demand of high memory instances, AWS have disclosed their SAP HANA instance roadmap (8TB and 16TB in 2018) and just made 4TB x1e instances available. A few examples of how AWS helped SAP customers cut costs, improve performance and agility include BP reducing 1/3 of their SAP infrastructure cost, Zappos successfully migrating to SAP HANA on AWS in less than 48 hours and enabling a major Healthcare and Life Science company to run BW on HANA with 30% better performance vs. on premise. 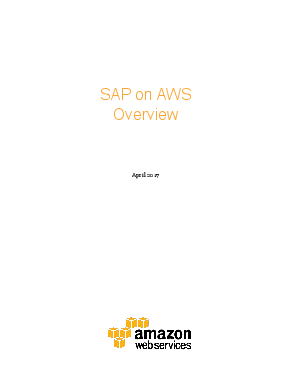 This guide is intended for SAP customers and partners who want to learn about the benefits and options for running SAP solutions on AWS, or who want to know how to implement and operate their SAP environment effectively on AWS.